Jesus in Love Blog: Happy Easter from Jesus In Love and Kittredge Cherry! Happy Easter! Christ is risen! Rejoice! 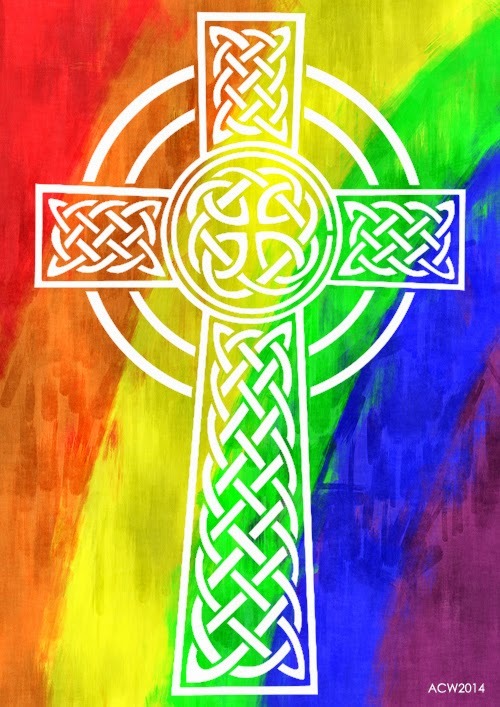 A rainbow, symbol of the LGBTQ community, shines behind a Celtic cross of interlaced knots in this year’s Easter image. May you be wrapped in God's infinite love as the never-ending paths of spirit and flesh weave together in your life! The braided “never-ending path” of decorative Celtic design can represent the crossing of spiritual and physical paths in life. The ring that surrounds the intersection of the Celtic cross is said to symbolize God’s infinite love, Christ’s halo or the sun. For the true meaning of Easter, check out The Passion of Christ: A Gay Vision with art by Douglas Blanchard and expanded commentary by Kittredge Cherry. 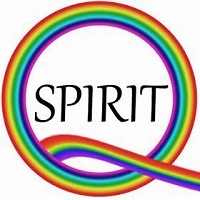 You are invited to give to my Easter offering to support my work at Jesus in Love for LGBT spirituality and the arts. Give now by clicking by visiting my donate page. Thank you to everyone for the many ways you show support. Christ is risen indeed! Happy Easter!